Your Friendly Neighborhood Italian Restaurant! Olive Garden Italian Kitchen has finally landed on the shores of Malaysia. The famous American Italian restaurant chain, with a staggering 800+ outlets worldwide, has been serving comfort Italian cuisine since 1982. Started in Orlando, Florida, the family friendly casual dining restaurant takes on modern Italy traditions by serving hearty Italian food that one can enjoy on daily basis. Joining its other sister chains of Red Lobster and Longhorn Steakhouse, the first Olive Garden Italian Kitchen opened in Mid Valley Mega Mall on May 2015. The restaurant is not as big as its other international chain but is designed with comfort in mind. Echoing its other international outlet theme, Olive Garden Italian Kitchen Malaysia has lots of natural wood and stones elements to exude warmness and comfort when dining. The dining area is sectioned and diners can choose from banquette seating to the regular table setting. One can even catch a glimpse of the kitchen actions in the dining room. The menu at Olive Garden take diners into the homes of modern Italian where there are lots of hearty Antipasti, Piadina or Flatbread Pizza, Soup, Pasta, Meat, Seafood and Poulty Main Dishes as well as Dessert. Kids below 12 years old Eat for Free all day and all week. T&C applies. One highlight of every Olive Garden restaurant all over the world is their Unlimited servings of Soup or Our Famous House Salad together with their freshly baked Breadsticks with any order of entrée for the diner. Olive Garden’s Breadsticks is authentic Italian bread that is deliciously warming and simply a must at every Italian table. The Breadsticks have a medium dense texture and has a beautiful aroma. I love soups and the Italians are famous for their soups. Nothing fancy but rather homestyle hearty and rustic soups that warms the tummy at every meal. One gets three choices of soups at Olive Garden. From Pasta e Fagioli (RM11.80) to Chicken & Gnocchi (RM11.80) and Minestrone (RM11.80), these soups are good for our heart and soul. 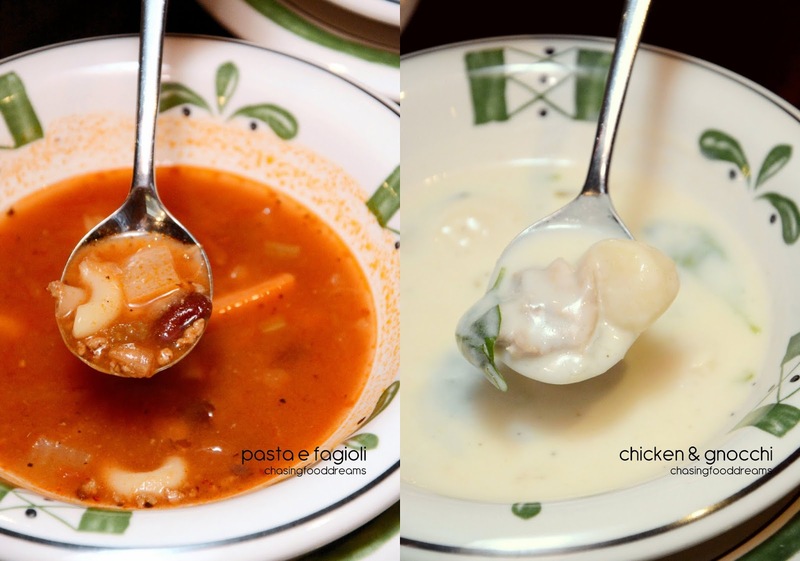 Pasta e Fagioli and Minestrone are tomato-based soups while the Chicken & Gnocchi is a cream based soup. While the Pasta e Fagioli has beans, ground beef and pasta in the soup, the Minestrone is a vegetarian classic of vegetables and pasta in tangy tomato broth. The Chicken & Gnocchi is a good choice for those who loves creamy soup and this one has bits of roasted chicken, spinach and soft traditional Italian pasta dumplings called gnocchi. To kick off any meal at Olive Garden, one should start with some of their Antipasti dishes, especially when dining in large parties. Since we had quite a large group that evening, we shared their Sampler Italiano (RM59.90) which has Calamari, Lasagna Fritta and Shrimp Scampi Fritta served with two sauces. Lasagna Fritta is actually pieces of lasagna crumbed, fried and served over Alfredo sauce with a finishing of marinara sauce and parmesan. One can opt for a spicy or non-spicy version of deep fried crispy Calamari or Shrimp Scampi Fritta. The Shrimp Scampi Fritta is lightly crumbed, fried and tossed with garlic and lemon butter or a spicy hot pepper sauce. Everything on this sampler appetizer platter is delicious when savored hot. The Italians do love their cheese and so cheese dishes are plenty in the Italian cuisine. We had an order of Smoked Mozzarella Fonduta (RM29.90), a three-cheese fondue that is best enjoyed with bread. The oozing melted cheese had us enjoying bold cheesy flavours of mozzarella, provolone and parmesan. Salty, cheesy and umami flavours are my kind of food! Chicken Parmigiana (RM26.90) is one of the more popular Italian dish that is much-beloved by many Italian households. Crispy crumbed parmesan chicken is fried and topped with homemade marinara sauce and mozzarella cheese before being finished on the broiler to gratin it all together. The chicken is always served with a side of spaghetti with marinara sauce. Everything on this dish screamed simple but delicious comfort food that one can enjoy on a daily basis. Olive Garden also has a large dish called Tour of Italy (RM59.90). It’s a dish one orders when one cannot decide what to eat. Three classic dishes of Chicken Parmigiana, Lasagna and Fettuccine Alfredo is a dish meant to be shared unless one can really packed on the carbs. It’s a familiar platter of Italian favorite flavours all at one plate. Here’s another lasagna dish of Lasagna Primavera with Grilled Chicken (RM38.90). Its layers of pasta and vegetables with ricotta, mozzarella and parmesan cheese lasagna baked till soft and melted and served with grilled chicken and creamy parmesan sauce. It’s a nice change to be enjoying the light vegetable lasagna instead of the richer meaty one. The grilled chicken also made the dish a bit healthier. If you are up for a treat of the king of crustaceans, Olive Garden has a scrumptious Lobster Fettuccine (RM53.90) that seafood lovers will rejoice in happiness. The pasta dish has Maine lobster tail and shrimps cooked in a rich lobster seafood cream sauce served on fettuccine pasta. The sauce is moreish and full of seafood essence. Every slurp is creamy and delicious while our lobster tail was nicely cooked till tender. Being an ardent salmon lover, I am always up to ordering salmon dishes when I see one. The Salmon Risotto (RM45.90) certainly caught my attention. Pairing up with another favorite dish of mine, the risotto, one gets a nice piece of grilled salmon, shrimp, seafood risotto and a tomato and basil pesto. I like my salmon cooked with a medium center so make sure to let the staff know how you like your salmon cooked for extra pleasures. Besides seafood, Olive Garden also has a few beef specialities. We had their Steak Toscana (RM79.90) and Center Cut Filet Mignon (RM79.90). The Steak Toscana is a piece of nicely marbled ribeye cooked to your likings. Simple flavourings of butter and fresh herbs are added to the ribeye to enhance and keep the beefy flavours. Enjoyed this with creamy garlic mashed potatoes for a solid steak and potato dinner! For those who prefer leaner cut but tender meat, go for the Center Cut Filet Mignon as the premium center cut filet is deliciously tasty and tender. Also prepared with minimal ingredients, I can really take the beefy goodness of the filet with a light hint of buttery richness. This one is served with grilled vegetables. We ended our meal with Italian desserts of Piccoli Dolci (RM6.80 for 1 / RM18.00 for 3 / RM29.00 for 5). These are mini glasses of layer desserts inspired by Italian desserts. Choose from the five flavours of Almond Tiramisu, Chocolate Mousse, Lemon Mousse, Dark Chocolate Caramel Cream and Strawberry & White Chocolate. My favorite was the Dark Chocolate Caramel Cream and Lemon Mousse. Then there is the Black Tie Mousse Cake (RM12.80), a chocolatey and cheesy cake that is lusciously rich and decadent. Dark chocolate cheesecake, creamy mascarpone custard and chocolate cake is a match made in heaven in the dessert world. Utterly rich with dark chocolate notes, the cake will have chocolate and cheese lovers sighing at pleasure. Another famous Italian dessert that appears in almost every Italian restaurant I know is the Tiramisu (RM12.80). Olive Garden’s version is fairly light with a good note of espresso soaked ladyfingers sponge and a thick layer of mascarpone custard before being finished with a generous layer of cocoa powder. This one is a non-alcoholic version so kids can enjoy them too. 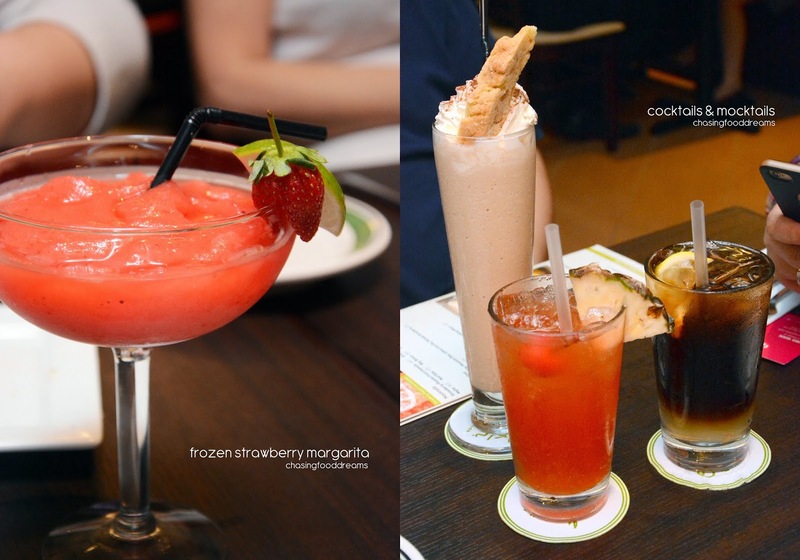 We enjoyed our dishes with lots of happy giggle juices of Frozen Strawberry Margarita (RM31.00), Frozen Tiramisu (RM29.50), Long Island Limoncello (RM32.50) and Strawberry Passion Fruit Limonata Mocktail (RM16.50). They make a mean and super refreshing margarita here so make sure to order one! Olive Garden great for hearty Italian comfort food. It’s also a great place for casual dining with family and friends. With a plus point of Unlimited soup or salad and breadsticks with every order of entrée and kids below 12 eat for free, Olive Garden makes dining there a satisfying pleasure! Top Chef is produced by Magical Elves Product , which Dan Cutforth and Jane Lipsitz serve as executive producers click here . Italian foods most popular in the world. Every people follow the Italian kitchen and foods. Italian people like to cook with green life cookware. ceramic cookware also like most people. Thank you for information. Do not forget to visit my blog here to refer to the information!